Please share with us your experiences with this project. Your kind input is greatly appreciated. We will use your evaluations to help us improve our program and help with fundraising. We request an evaluation form to be submitted in 3-4 months after installation of the Rescue Animal Mp3 music in your shelter. Please fill in the form below or download evaluation form here (print it out, fill it out and fax 330-266-2501 or mail it to us). Thank you! I was inspired to c reate Calm My Pet products to help all pets and to raise funds for the non-profit Rescue Animal Mp3 Project. I formulated and designed the Calm My Pet Products to help pets be calm, balanced and healthier. Many pets in my practice have an emotional component to their illness or primary emotional problems. Addressing pet’s emotions helps their body to allow healing energy to flow. 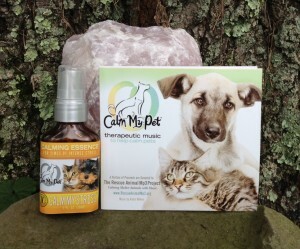 Calm My Pet Calming Therapeutic Music CD and my custom formulated Calm My Pet products are available for wholesale purchasing which would be very helpful for your adoption customers! *All Calm My Pet products sales will help raise funds for the Rescue Animal Mp3 Project www.RescueAnimalMp3.org . Visit www.CalmMyPet.com or call 330-266-2500 for more information. Have you played music in your shelter prior to the Rescue Animal Mp3 Project? How long has the music been installed in your facility? What HOURS is the music playing for the animals? Is it in ALL Kennel rooms? Are the MP3 player and cords functioning properly? Work Staff & Volunteers Accepting of the Music? Does your Shelter have a retail store? Would you like any addtional assistance with the music or calming the animals? Do you have any suggestions to improve the Rescue Animal MP3 Project? If desired, please share your comments or testimonials that may be used on our website and literature. Feel free to add any additional comments. so more animals can enjoy the calming music.